The countdown has begun to move on from college dorms and your parents' basement. Freedom is so close you can taste it; no longer will your comings and goings be monitored. You can eat pizza and cookies for breakfast, lunch and dinner. But before these dreams become reality, there's a lot of work to be done with the whole relocation thing. To help you combat packing panic, here are 12 moving tips to get you smartly on your way. Before you begin loading up boxes, go through all your stuff and weed out items you don't want. There's no point in adding this clutter to your new place. Remember, one person's trash is another's treasure. Before dumping and donating unwanted items, give friends and neighbors a chance to dig through for hand-me-downs. They'll appreciate the thought and it's one less thing for you to move. College houses are not always in the greatest condition. Since you don't want to be on the hook for other tenants' wild times, get together with the landlord before you move in and do a walk through. Document any existing damage, snap a few photos and get the landlord to sign off on a list of problem areas. This will ensure you don't get nailed for pre-existing issues. Before moving day, make sure to call the electric, water and cable companies so you have service as soon as you arrive. There's nothing more disappointing than moving in and finding the lights aren't working. One of the many great things about college is flexible scheduling. If you have the option, plan to move mid-week. This way, you can move at your own pace and don't have to compete with others cramming their move into one hectic weekend. Also, moving trucks are typically cheaper to rent in the middle of the week. If you do end up hiring movers, be sure to read this article from MainStreet.com to learn about secrets moving companies don't want you to know. If you have bags, suitcases or even coolers, think about how you can use them like boxes. Pack the small stuff inside larger items like Russian nesting dolls. The fewer trips you have to take back and forth, the more time and money you'll save. Before you buy expensive packing materials to protect your precious possessions, consider what you already have around. Dish towels, T-shirts and pillows all make for great packing materials. Your local grocery store will usually contribute some free empty boxes if you ask nicely during off-peak times. To cover more delicate furniture, hit a thrift shop for cheap blankets and tape them in place. If you're the type that likes to plan ahead, it's tempting to shop for everything you think you'll need before the big move. In many cases, you won't need nearly as much as you expect. Fill in the space with what you already have before picking up a new sofa or coffee table. Once you know what you need, go shopping with roommates and save on some shared items. 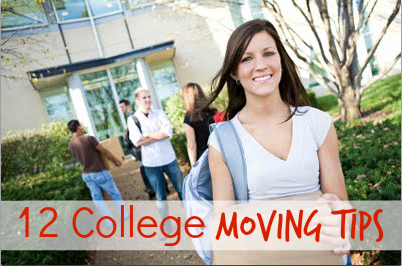 Try using coupons for discounts on back-to-college lines from stores like Target. They can easily be found at such sites as CouponSherpa.com. Trying to lug a floppy mattress up three flights of stairs by yourself is no fun at all. Your closest friends might help you with the move, but likely with some reluctance since no one likes moving. Sweeten the deal by planning in advance and offering bribes. A free meal and some suds can make it harder to resist. You won't find much relaxation in a scented candle when it's melted all over your clothes. Even though temperatures are dropping, mid-day heat is still strong at the end of summer. If you have items that can melt or will be damaged by the sun, make sure to pack them in an easily accessible place and unload them first. Don't forget about the bathroom, either. Aerosol products, such as body spray or sunscreen, can explode after sitting in the sun. You're already paying a ton for tuition; you might as well make the most of your status as a student. Whether you're picking up packing supplies, a new couch or just some snacks, there's no harm in asking about a student discount. Once you get settled in there's going to be plenty of time to unpack your knick-knacks. Instead of worrying about the small stuff, get major items out of the way first. Couches, beds and tables should all be in place before you begin putting up posters. Having your furniture set up will allow you to fill in the gaps and make your new house feel like a home. It really helps to plan where furniture will fit before you move. Rough out a floor plan and fit in the major pieces so you have a guide on moving day. It also helps to have someone guide the move-in process. Spend the day playing traffic cop, indicating where boxes and furniture should be placed so you don't have to move everything after your crew has left. If you don't have that luxury, these six online room design tools should help you plan ahead. Do you agree? Do you have any other tips? Feel free to share below. Thanks to Brandon Farestad-Rittel for providing the guest article. He is a college-savings expert for Kinoli Inc. Based on his own college experiences and extensive research, this recent graduate has covered a variety of topics, including the college selection process, for-profit colleges, and the modern era of textbooks.